Two of Nancy Zieman’s favorite hobbies were gardening and sewing. A little over 20 years ago, she was introduced to a quilting technique by Natalie Sewell, nationally known landscape quilt artist. Natalie and Nancy became fast friends and scheduled two–three quilting dates each year. During this three-part series on Sewing With Nancy, Nancy and Natalie simplify the Landscape Quilting process so that everyone interested can enjoy the pleasure of creating outdoor scenes in fabric. A great beginner’s project is to create a close-up garden scene from fabric. Natalie’s design, Summer Flowers, is the featured quilt during the TV program. It was used as an example for choosing fabric, messy and fussy cutting, as well as designing with raw-edge appliqué. The book, Beginning Landscape Quilting, is a step-by-step guide for designing simple scenes. We’re confident that you’ll have great success. First, start with an inspirational photo. Nancy and Natalie show how to study the photo, which will help in the fabric selection process. Watch online and follow along in the book and see exactly how to create a garden scene. Below are pages from Beginning Landscape Quilting featuring the steps to create a garden scene. It’s a direct step-by-step guide, leaving no question about what to do. We will share a few of Nancy’s and Natalie’s Landscape quilts. 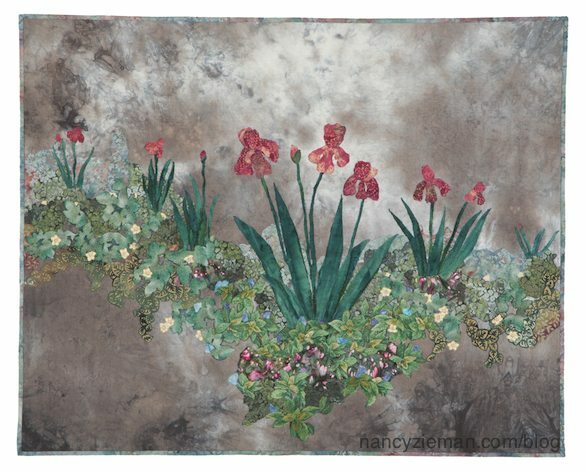 Irises in my Garden is one of Nancy’s early landscape quilts. The next landscape quilting topic focuses on ground cover. We’re certain your eye focuses on the Dancing Maple in Natalie’s quilt by the same name. The lively and spirited tree is the star of the design. Yet, without the interesting ground cover, the depth and dimension in the quilt would not be as impactful. If your inspiration photo features ground cover, Nancy and Natalie share the tricks of choosing fabric and designing that all-important landscape quilt element. You’ll learn that the inspirational photo is a starting point. Nancy’s and Natalie’s quilts rarely, if ever, look like the inspiration. That’s not the point! Dogwood by Natalie is another showcase quilt. You almost feel as if you could walk right into the woods! Nancy’s design, If Trees Were Teal, is more impressionist than realistic. This inspirational photo gave Natalie an idea of what fabric to choose. Watch Beginning Landscape Quilting (Part One and Part Two) on Sewing With Nancy online. The NZP Team will be taking a break from winter at the WPT Garden Expo this Saturday. We hope to see you there! i love the colors of autumn and the view out my kitchen window is beautiful that time of year. I’d like to capture that view and have it year round in a wall hanging. I love the colours of fall and the trunks of birch trees. With these instructions I could actually try a landscape quilt. I love all the seasons as they move from one to another. But most of all, spring is a new beginning. Plants that have been dormant take on new life, Seeds sprout, the woodland creatures reproduce, and I look toward all of the new things I can do. Spring is the season with the most hope. We have a 65 acre woodland. I love all the seasons, especially autumn. I would love to make a Spring Landscape Quilt depicting a woodland scene with trillium on the forest floor. This would be a fabulous stash busting project! My fabric stash contains colors for all four seasons! Thanks for the opportunity! I would LOVE to Win this Book! I have several family vacations that I would like to make into a wall quilt for my living room. I want to learn to make all four seasons! All Nancy’s landscape quilts are beautiful, I would love to make some too. So sad she is gone. Thank you for the new give a way. I think fall would be my pick. I would very much like to learn landscape quilting. I think I would start with fall and its glorious colors. Thank you for another opportunity to win! My Favorite Season for a Landscape Quilt would be Summer. I would include a Lake with a canoe or row boat, not a motor boat. There would be large BirchBark Trees with small flowers along the path surrounding the lake. Very much like the one I used to visit in Maine for a couple of weeks in the summer. I would make a spring or summer landscape piece since these are my favorite seasons. I sitting here in my home…so cold…..and thinking about spring….so I would pick springtime. Thank you for a chance to win. I would love to do yellow daffadils that pop up in the early spring. They always bring hope and joy that spring is here. I would have to pick winter. I love evergreens in the snow. I think I would have to choose fall since you could use so many vibrant colors for your palette. Love the idea of fall colors and textures in a cozy-up quilt. There’s just something balancing about the transition of autumn. So peaceful and productive. This is my next artistic goal. I have ever been able to paint or draw, but I am proficient in sewing and quilting. Also, as a gardener and lover of nature, I am anxious to express this side of my personality. I love spring but think a good place to start would be fall or winter. I’d like to create a quartet of the same scene shown in each of the four seasons. I am a newbie to quilting and would love to learn how to do landscape quilting. I love the colors of fall and trees are all seasons favorites. I loved the red maple tree quilt that Natalie made. I would start with an autumn quilt. The colors are so pretty in the fall. I would love to try landscape quilting. Nancy and Natalie make it look so easy and so fun! I have been thinking of trying a landscape quilt for several months now, and actually looked at some of the video via youtube. I think I would be more confident if I could follow along in the book. Leaning toward an autumn scene. I think I’d try fall or winter. I would choose either Spring, with all of the varied greens, or winter, which has options for whites, and blues. I live near the Columbia River Gorge in Oregon, which provides so much inspiration – it would be a delight to capture some of that beauty! I think Spring would be my first, love green contrasting with colorful blooms. I love spring. The beautiful shades of green. I love all landscape seasons, but especially fall when the maples show their glory and then there are a few ghostly birches here and there. I have only been quilting for a year, gosh am I having fun! Nancy your blog posts have given me so much inspiration. I bet this book and DVD class are wonderful. My first project would be winter trees, my second spring flowers or my pond out back. Best of luck with your new book. I would choose Fall for all it’s glorious colors as I now live in a area where there are not very many deciduous trees and I so miss that spectacular show mother nature puts on! Love to do a spring landscape. Love to incorporate all the wonderful floral fabrics available to create an amazing English country garden. Love all the seasons listed, but think would start with the fall one, for one of my daughters, then think spring for other daughter. Have always loved the ideas, but was afraid to try them. Thanks for all the great ideas. I love the beginning of spring with a pine tree forest & beautiful dogwoods! Wonderful ideas – how fun! I’d have to choose fall to showcase since it is my absolute favorite time of the year with its colorful leaves and cool, crisp air! I would really love to showcase magnolias and dogwoods in a landscape wall hanging (quilt). This is inspiring to watch and learn. Thank you for sharing this with us. I would like to try a Spring quilt. I love the fall so I would want to do landscape of fall foliage. I did one landscape quilt after watching Nancy and Natalie, now would like to do a snow scene. I would love to make a memory quilt of the trip my husband and made by motor home from Texas to Alaska. That would involve several blocks as too much beauty for just one block. My husband and I made a motor home trip to Alaska from Texas. Our trip of a lifetime and I’m greedy as I’d like to create several blocks to put into a memory quilt. I would combine spring and summer flowers to make my own fantasy,dreamy landscape world. Thanks for the opportunity to win. I was so fortunate to be able to attend a couple of Nancy’s lectures 4 years ago at a BabyLock event in Shreveport, LA. She showed us the landscape quilting, and she made it look so easy! I will never forget how sweet and personable she was! What a beautiful way to express the beauty around us. Spring for refreshing after the winter months. I love the sun shining on the snow that is in the trees just after a snowfall. That truly is magical! Spring or summer with tall trees, water and flowers would be my choice. I remember watching this series when PBS still showed them! I imagine using some metallic and shimmer fabrics to capture the early morning sun on icy, dew covered pine branches in winter. How lovely this would be to enjoy all year! Add in a bird feeder attracting some forest friends and it’s magic for sure. I love the cold and snow that winter brings but worry about the people that need to work and drive in it. With a landscape winter scene, I could still enjoy the beauty without the worry. I would love to do an autumn landscape quilt. It’s my husband’s favorite time of year, and the warm colors of orange, red, brown and gold are so vibrant. Thank you for giving us an opportunity to learn this technique. I would love to create a spring landscape quilt. I love spring flowers, especially lilacs and tulips and hyacinths and everything spring. Sunny summer sunflower garden is my choice. A magnificent maple lives in my front yard that every fall becomes quite the showstopper. I wish to create a wall quilt inspired by this tree for when we move away. Winning Nancy’s book would definitely help me accomplish this. I’ve admired these quilts for so long and have been hesitant to try one. I’d love to do one for spring as I’m so tired of the ice and snow where I live. Since my favorite color is green, my season would be spring. I can remember walking to my school bus stop and crossing a creek where the trees and plants were just coming back and starting to grow with the beautiful greens. I am a gardener so that also helps. In New Mexico has my heart…the junipers, yuccas, and cacti along with the wildflowers and wildlife is a masterpiece. I would love to recreate this to enjoy all year round. This is an art form I have admired for years. I love the look of wildflowers so that will be my choice to try once I retire and that time is coming up soon. The imagine of snow on the trees would be a great landscape quilt. On our trips to Bloomington, the trees looks so beautiful with the fresh snow on them. Would love to learn all the in’s and out’s of making a realistic landscape quilt. The book and or cd would be a very treasured keepsake and remembrance of Nancy. A dew covered summer morning would be my first inspiration. I miss Nancy’s creativity and guidance so much. I am entranced with the concept of landscape quilting and want to add this to my quilting knowledge and projects. I hope I win. I would choose winter…with deep, dark shadows and a hint of blue to the snow. Landscape quilting looks like a lot of fun to recreate beautiful photos for everyone to enjoy. Nancy is great at making everything look easy so we can channel our inner creativity. This is on my bucket list to try. Fall would be my pick for a landscape quilt. Yes because of Nancy’s inspiration, learning landscape quilting is on my to do list. It is so beautiful. Nancy will always be with us!! Thanks.